(May 1, 2014, New York) WEBBCREATIVE is pleased to announce Zoe Buckman, on view at Pulse Art Fair, New York, as part of PULSE Projects, May 8-11, 2014 at the Metropolitan Pavilion, 125 West 18th Street, New York. Buckman will present a selection of four large-scale photographs from her most recent body of work entitled, PRESENT LIFE, which explores time and life’s transient nature, investigating themes of mortality and examining the fleeting moment when something living begins to perish. The series aims to explore that which creates but also ceases, highlighting the temporary nature of life and the passage of time. The photographs in PRESENT LIFE focus on bouquets of flowers; objects that exist in peoples’ living spaces for about a week, bringing happiness and life to their environment, reminders of the natural world. 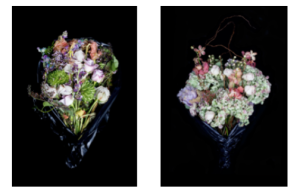 Fascinated by the in- between stage – the start of the end – when the flowers are still beautiful but have begun their decline and are somewhere in between life and death, Buckman wrapped flower arrangements in garbage bags and photographed them after one week, about the time when they begin to spoil and decay and most of us throw them away. Capturing the intricate detail of the flowers in large-scale photographs, Buckman creates a visceral experience, allowing the viewer to almost smell the decay of beauty and life. Buckman works in various mediums including: photography, neon, and most recently embroidery. She has presented solo exhibitions, with Milk Studios in New York (2010) and Opera Gallery in London (2011), featuring her photographic series LOOS, a sequence of staged images set inside ladies’ public powder rooms, with real conversations overheard by the artist etched onto the glass of the image. Buckman has been included in several group exhibitions including the Hidden Gems Project for Christies, which was exhibited at The Getty Images Gallery in London and then auctioned at Christies and “Small Is Beautiful”, a group show at Flowers Gallery in East London. Buckman lives and works in New York.